Fall is here and the cooler weather makes me crave warm comfort food. Let this casserole dish fill your tummy and warm your heart tonight. 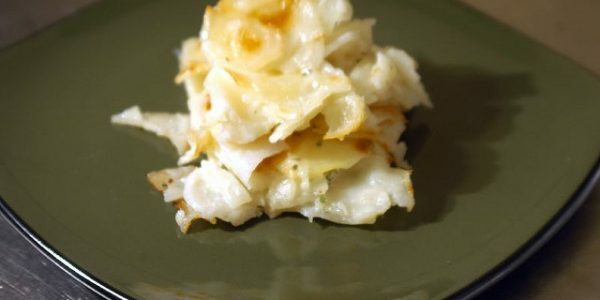 Delicious and comforting, the cauliflower extends the potato dish without adding calories. 1. Preheat the oven to 350Â°F. 2. Bring a large saucepan of water to a boil over medium-high heat. Add the potatoes and boil for 15 minutes, or until fork-tender. Remove to a bowl; do not drain the water from the pot. Add the cauliflower to the pot and boil for 5 minutes, or until fork-tender. Place in the bowl with the potatoes. Mash with a potato masher or an electric mixer on medium speed. 3. Heat the oil in a small skillet over medium-high heat. Add the onion and bacon and cook, stirring, for 5 minutes, or until soft. 4. Spoon half of the potato mixture into a baking dish. Sprinkle with half of the cheese and half of the bacon. Repeat layering to use the remaining ingredients, ending with bacon. 5. Bake for 10 minutes, or until heated through and the cheese has melted.